Below are actual examples of how OMS has impacted our clients practices. Optometrists continue to find it difficult to complete the credentialing process for acceptance on medical insurance panels. This imperative first step can take six months or more and once approved, requires quarterly monitoring for upkeep. The following is an example of a practice that went from zero medical revenue to $80,000 in ten (10) months. The practiced opened as a cold start in 2007. In September 2009, they sought the help from OMS to add and implement the medical model in the practice. OMS credentialed the doctor on medical panels (IE: Medicare, BCBS, UHC), set up administrative processes, including a revenue cycle platform, and began to focus on implementing the key elements of the medical model. In 10 months, the practice went from zero revenue to generating over $80,000 in medical eyecare services. 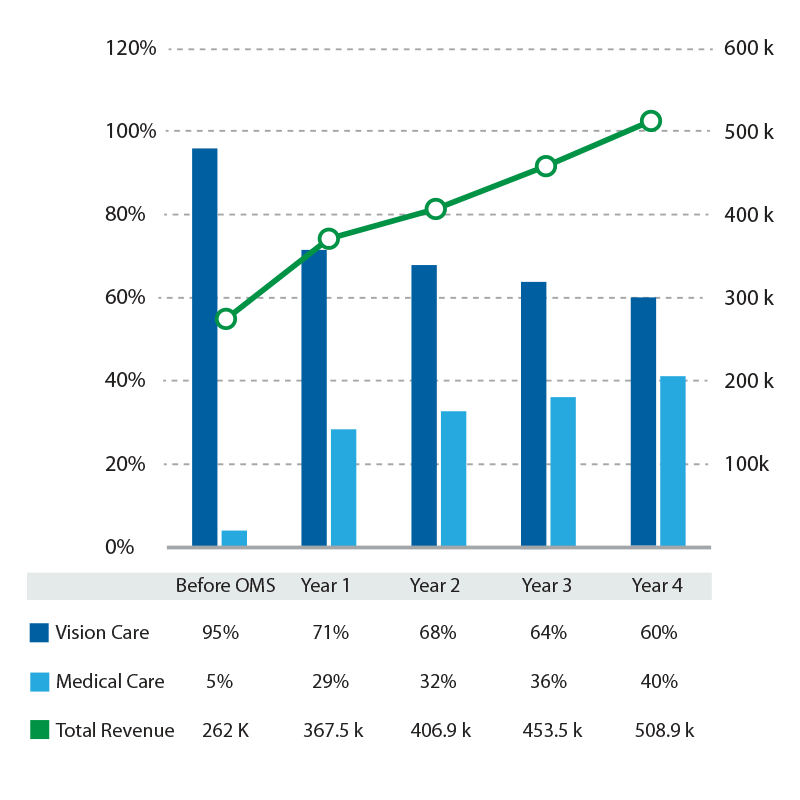 As of today, medical eyecare represents 21 percent of patient care revenues in the practice and is continuing to grow. An appropriately equipped optometric practice should bill at least 100-150 clams per month generating $18K to $20K in monthly reimbursements. In this specific example, our client requested OMS’s assistance in implementing the medical model. We set up the revenue cycle platform, implemented administrative processes and focused on staff training and education. The impact of the OMS system is displayed below. Total revenue growth is up 75% from before implementation to the end of year 4. Overall medical growth rate is 850% since implementation with a shift in patient care percentages from 5% medical to 40% medical in year 4.